Morocco’s Sahara desert is a magical place to send a few nights. Tours to the Sahara desert will have you exploring the breathtaking sandscape and a place called Merzouga, which is south of Erfoud. The beautiful Erg Chebbi dunes is 724 km (450 miles) from Marrakech traveling through the High Atlas Mountains and stopping by some amazing sights in south-eastern Morocco. 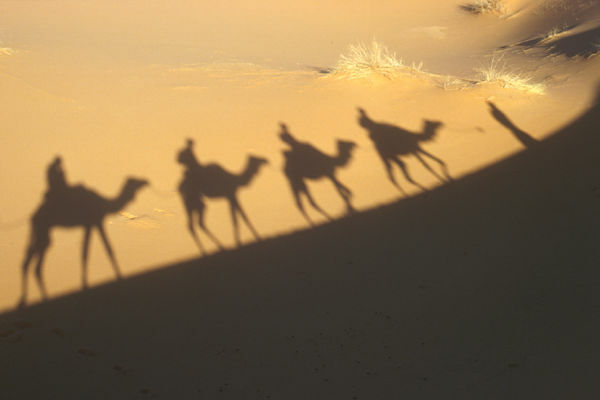 Camel trek is the best way to get around and explore Erg Chebbi, although you can get around in a 4×4 vehicle. The overnight in the Erg Chebbi can be either a Bedouin tent in the dunes, or a luxury tent at the Auberge Kasbah Tombouctou. The best season to visit the Erg Chebbi is spring—this way you can see flamingoes flocking at a large seasonal lake close to Merzouga.